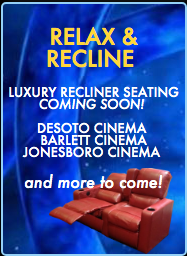 Malco's much-anticipated Downtown movie theater has an opening date: March 7. The opening of the theater — the Powerhouse Cinema — is timed to coincide with the release of the latest Marvel Comics-inspired epic, "Captain Marvel," starring Brie Larson (a Best Actress Oscar-winner for "Room") as an Air Force fighter pilot turned intergalactic superhero. Projected by box-office analysts to earn more than $100 million in its first days of release, "Captain Marvel" likely will occupy most of the theater's seven screens for the opening weekend, with a regular program of more varied movies beginning soon after. As signaled by the lighting bolt logo that will be added to the historic old smokestack that was incorporated into the theater's design, Malco executives and Downtown boosters hope the Powerhouse will add electricity to a South Main district already buzzing with new business and residential construction. "We left Downtown more than 40 years ago, so this marks our return," said David Tashie, Malco senior vice president for operations and construction. Located at 45 G.E. Patterson, between Main and Front streets, the $10 million Powerhouse represents the first Downtown Malco cinema since 1976, when the 103-year-old, Memphis-based chain sold its movie-palace flagship, the Malco, to the nonprofit foundation that redeveloped the theater as the Orpheum. The Powerhouse also will be Downtown's first commercial movie house since the Muvico multiplex closed in 2008, after seven years inside the now defunct Peabody Place shopping-and-entertainment center. With motorized reclining seats, an IMAX-style large screen and a full-service bar and restaurant, the Powerhouse is a "boutique cinema" designed for "comfort and luxury" rather than for high occupancy, according to Tashie. The seven screens contain just under 600 seats, total. In comparison, Screen 16, the largest auditorium at the Malco Paradiso, holds 367 seats by itself. Two of the Powerhouse auditoriums almost qualify as cozy: The rooms are spacious, but each one holds only 30 seats. Meanwhile, the Powerhouse's showcase auditorium is the 200-seat "MXT" or "Malco Extreme" theater, a Malco-branded "large format" auditorium with an almost 60-foot-wide screen intended to approximate if not quite match an IMAX venue. Ticket prices may reflect the "luxury" aspect, Tashie said. An adult non-matinee ticket could be $13, or a dollar above the cost at most other Malco locations. Long in the planning stages, the Powerhouse was designed and constructed over about three years, with various delays due to the challenges of incorporating its namesake structure, a 1914 brick building with a distinctive smokestack that was constructed by the Illinois Central railway line to provide steam and electrical energy to South Main's Central Station. Approval from the state Historic Preservation Office and the Federal Transit Administration (which had been working with nearby Central Station) was required for some of the design. Some challenges were unexpected. Tashie said all 857 window panes in the original power house lobby had to be replaced due to the presence of asbestos. Friday — less than two weeks before the scheduled opening date — the Powerhouse was humming with activity as workers mixed concrete, moved bricks and otherwise hammered, drilled and nailed at a site that seemed far from complete. "Believe it or not, this is how every theater looks two weeks before opening," Tashie said. The original power house provides the foundation for the cinema's lobby area, which contains the box office and an adjacent bar and restaurant with booths, stand-alone tables and a wood-burning brick pizza oven. The restaurant has its own entrance, and can be accessed by those not going to a movie. "We're really structuring this to be a restaurant with a movie theater," as opposed to a movie theater that also serves food, Tashie said. Occupying a 27,000-square-foot lot, the cinema is backed on its south side by a 200-space parking lot (which will continue to be home to the Memphis Farmers Market on Saturday mornings). Local film buffs hope the Powerhouse will enable Malco to book more so-called "indie" and art films. Said Malco senior vice president Jeff Kaufman, the company's film booker: "We're going to have a very broad-based group of offerings at this theater, not just studio films."